We are happy to announce the initial release of our *RStoolbox* package. 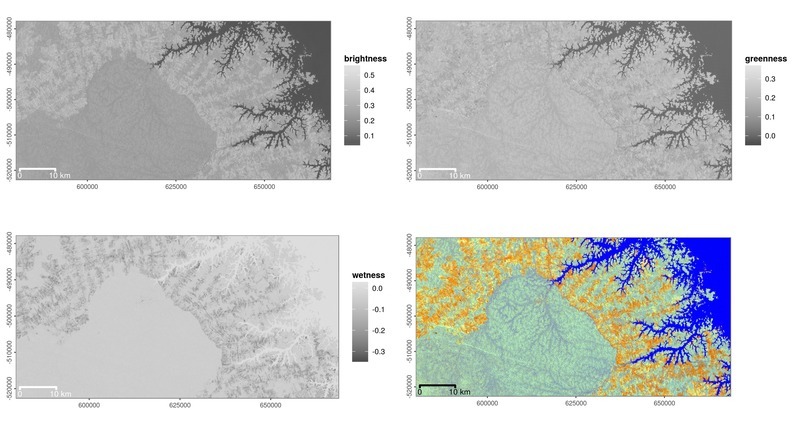 The package has been developed by Benjamin Leutner and will be used extensively in our upcoming book “Remote Sensing and GIS for Ecologists – Using Open Source software“. The main focus of RStoolbox is to provide a set of high-level remote sensing tools for various classification tasks. This includes unsupervised and supervised classification with different classifiers, fractional cover analysis and a spectral angle mapper. Furthermore, several spectral transformations like vegetation indices, principal component analysis or tasseled cap transformation are available as well. Besides that, we provide a set of data import and pre-processing functions. These include reading and tidying Landsat meta-data, importing ENVI spectral libraries, histogram matching, automatic image co-registration, topographic illumination correction and so on. Last but not least, RStoolbox ships with two functions dedicated to plotting remote sensing data (*raster* objects) with *ggplot2* including RGB color compositing with various contrast stretching options. RStoolbox is built on top of the *raster* package. To improve performance some functions use embedded C++ code via the *Rcpp* package. Moreover, most functions have built-in support for parallel processing, which is activated by running raster::beginCluster() beforehand. We sincerely hope that this package may be helpful for some people and are looking forward to any feedback, suggestions and bug reports.